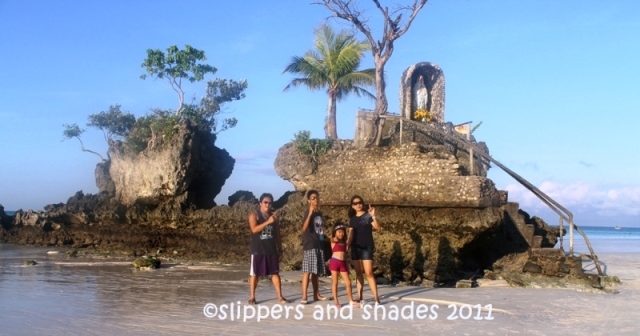 For our last day in Boracay, we woke up so early to visit the most photographed icon in Boracay, the famous Willy’s Rock. 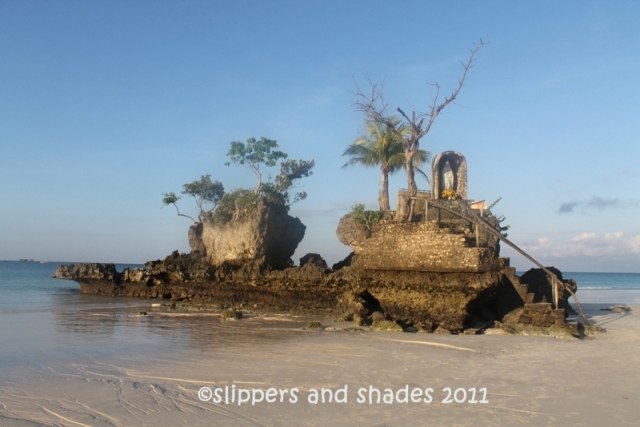 I urged my hubby and our kids that we will never leave Boracay if we can’t visit this spot. 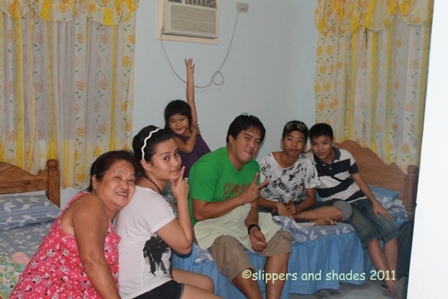 We were eager to go while the rest of our buddies were still sleepy, so tired of last day’s activity, hahaha! It was a cool morning as we walked outside St. Vincent’s Cottages. We had a limited time (our flight going back to Manila is 3:30 pm) so we opted to ride a tricycle (P60) going to the northern end of Station 1. 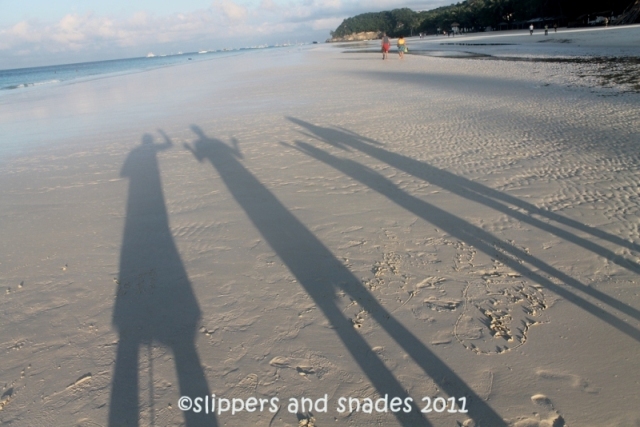 It wasn’t a boring ride as we saw the non-beach life of Boracay. When we reached Willy’s Rock, we were more impressed of the sand which was softer and creamier. Morning breeze was wonderful and so the stillness of the water. Tide was low. Willy’s Rock looks like an island. It was at its best for a beautiful photographic angle. Few people were roaming in the area and didn’t stay long. Good for us, we had the place all by ourselves. Early morning is the best time to visit Willy’s Rock. You could have your picture with no intervening people around. Just a few meters away was the Willy’s Beach Club Hotel (owned by Wilfredo Gelito and his wife Rebecca). The couple behind the Willy’s Rock. The Mediterranean style villas were somewhat impressive. Lounge chairs were in a single line at the beachfront. We rode again a tricycle going back to the hotel (ten minutes travel time). 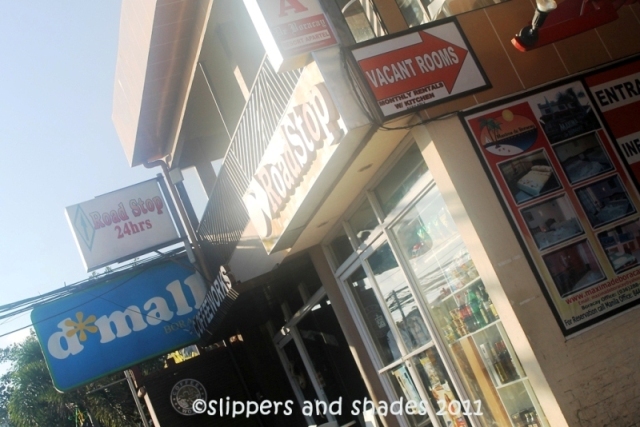 It’s when we went back that we saw D’Mall, the most popular mall in the island and two banks with ATM machines, Metrobank and BPI. After our breakfast we headed to the beach to swim. We were surprised when we saw a sandcastle. Julius, our boatman in our island hopping yesterday told us that this was already prohibited as there was an ordinance regulating sandcastle making in the beach area. 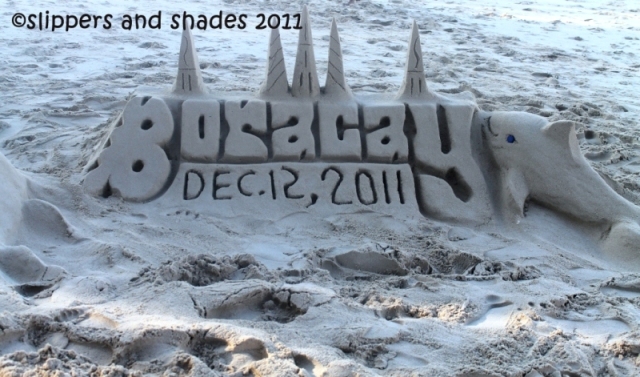 “Fee involvement” was one of the reasons why it was disappearing in Boracay. We felt very sorry when we saw the sandcastle maker sitting in the sand. His legs were both short (a case of a polio, maybe). He volunteered taking photos but he wasn’t asking for a fee. At 8 am, someone shouted, “the inspector is coming!” The handicapped guy hurriedly destroyed the beautiful sandcastle he made. 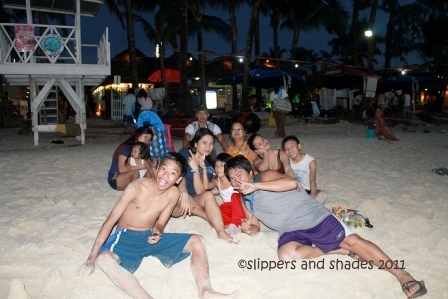 It was so pathetic seeing people like him in a beach paradise of Boracay. Whatever his purpose was, we voluntarily gave him money as gratitude for his humble service. We spent the last two hours in swimming activity with the whole gang. Shen didn’t want to get out of the water. Baby Rion enjoyed soaking her feet. We still wanted to swim for more, but we have to pack-up. Never mind the commercialized area of Boracay, the establishments that sprouted like mushrooms, the pulsating nightlife and the “crowd”. 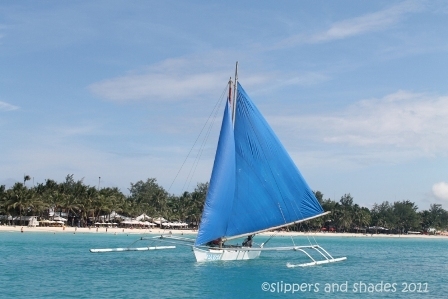 You have what it takes to enjoy Boracay’s pride, the sugar-fine white sand and the crystal clear waters. We’re aiming to go back. Till next time Bora! 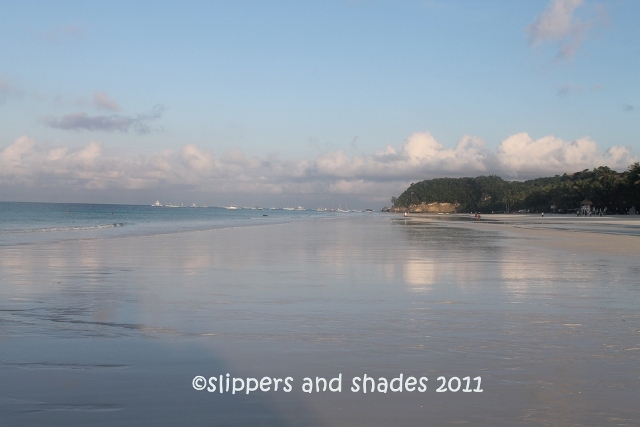 It was a gloomy morning so I have no sunrise photo of Boracay. But we were hopeful that the weather would cooperate for our island hopping this day. It’s time consuming if we will eat our breakfast in a restaurant. To save time, we cooked noodles while our teens brought hot pandesal in a nearby bakery. We were so thankful to Grace (our contact person in the resort) for providing us a thermal pot full of hot water and cups for our coffee and milo session. 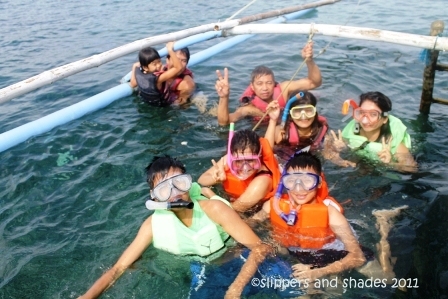 With cheez whiz as our filling, everyone was satisfied and off we went to our exciting island hopping. Julius is our contact person in our activity. Boat rate – P1,500. 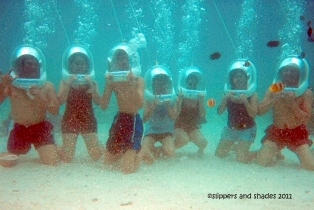 Our first activity was helmet diving (also called reef walking). It was offered to us for P1,000 but we haggled it to P350 with picture and video (burned in a CD). 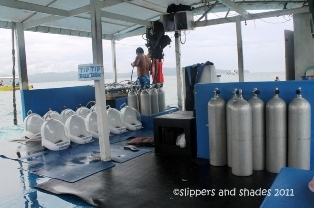 We were transported to the diving spot through a speed boat. We stayed in the floating cottage where the head suits and compressors were now being prepared by the crew. Mama and Shen got scared so they chose to stay and took care of our little Rion. An instructor briefed us shortly, telling not to worry wearing the 37-kilo head suit for it will weigh one kilo once dip in the water. He gave us the hand signs and things to do in our water activity. 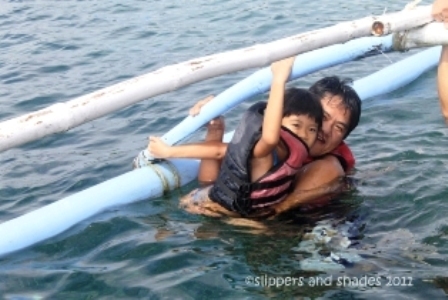 He accompanied us one by one in going down through the ladder until we reached the sea floor. The pressure was painful in the ears. As per instruction, we moved our jaws and pinched our nose to fight the pain. 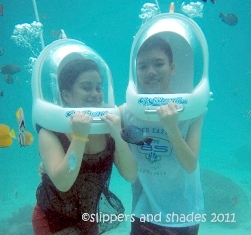 It was so amazing walking on the sea floor and watched the amazing perspective of the under the sea world. The visibility was so clear. We fed the colorful fish with bread. I was a bit disappointed because I was expecting that I could see lots of fish around us. But it was only few. Maybe five to ten years ago the abundance of marine life here was so wonderful. Who’s to blame anyway? 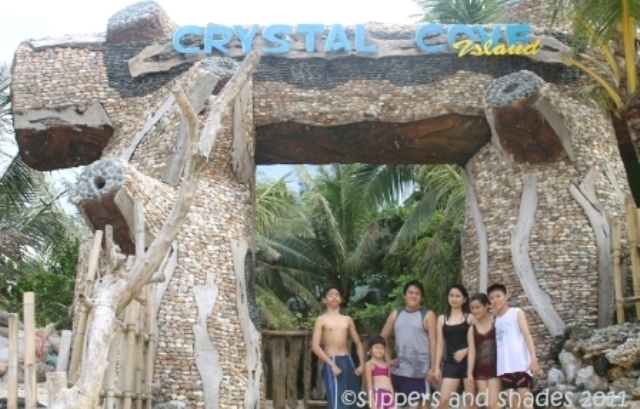 Our first stop was in CRYSTAL COVE ISLAND. Entrance fee applies only to the cave with rate of P200. We didn’t go inside instead we immersed ourselves to the water and had a refreshing swim for less than an hour. Sand wasn’t that fine compared to White Beach and had crushed corals everywhere but the water was crystal clear and clean. There was no store in the area so it’s best to bring food and water. 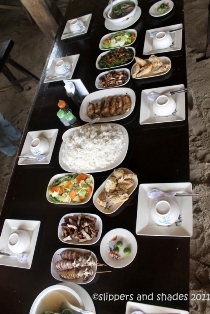 The resort is ideal for picnic. This is indeed a a stress-free day. 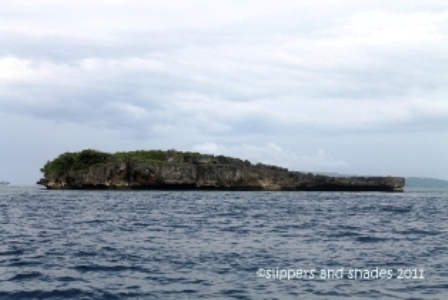 Next stop, at CROCODILE ISLAND. It’s time for snorkeling. My hubby and I were used to this activity. 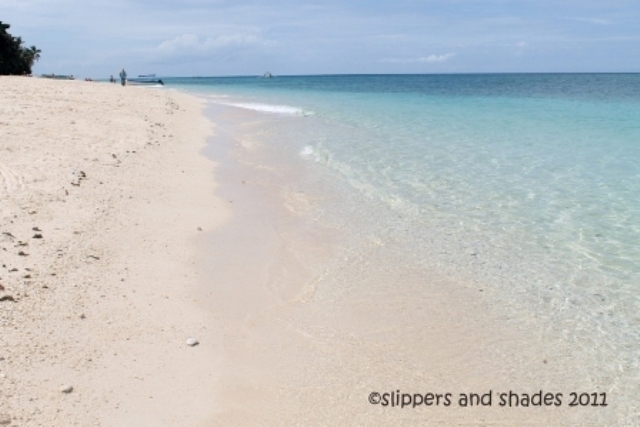 But every island has its own charm and wonder, it’s a must to explore and see the wonderful marine life. We were so excited just like the rest of our buddies and so we hastily jumped into the water. Corals were beautiful and so the zebra fish and the famous and lovable clown fish, nemo. I can’t help not to compare the abundance of marine life in Coron and Puerto Galera in this island, but those playful nemos caught much our attention. But because we were too busy catching them we didn’t noticed we were sailed away far from our boat in less than ten minutes. Gi and I were puzzled and we tried to go back to the boat, but we didn’t come close even a bit. A helpful boatman with a small boat came near us and gave us a rope. He advised us not to go far because there was a strong current in the area. We all went back through the rope and snorkel again just beside the boat. Last Stop. At PUKA ISLAND. The sand wasn’t that fine but what I like in here was the serenity of the island. The green rocky mountains added a scenic view. There were few people here, so you can really feel the nature is within you. We swam, we explored, and we walked in the long stretch. 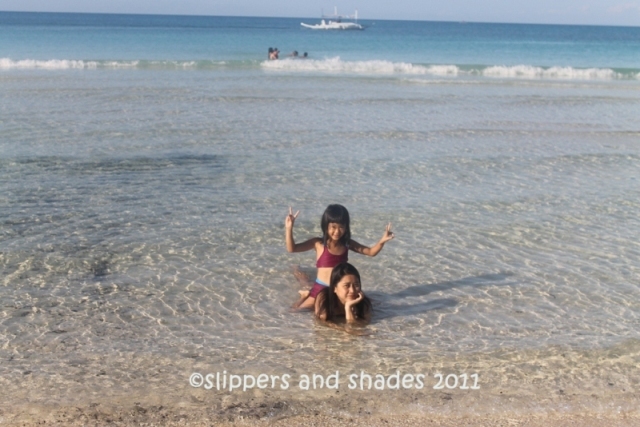 Getting tired, we sat on the sand and marveled at the vast expanse of the aqua blue water. So refreshing! There were eateries on the island. 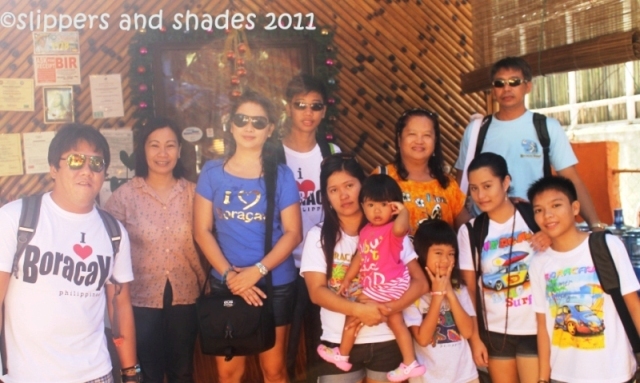 We chose to eat our lunch at Sea Shore Grill and Restaurant which was owned by a fellow Pinoy. It’s all our first time to eat a white snapper fish which costs P700. Half of it was grilled and half was boiled (sinigang with vegetables). Somewhat pricey, but everyone loved eating it. We also ordered grilled squid, fried chicken, adobong chicken, adobong kangkong and chopsuey. 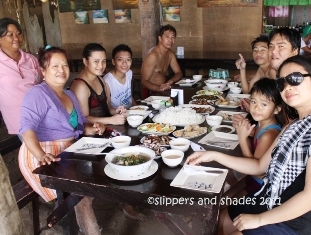 Our meal costs P2,665 for the ten of us. 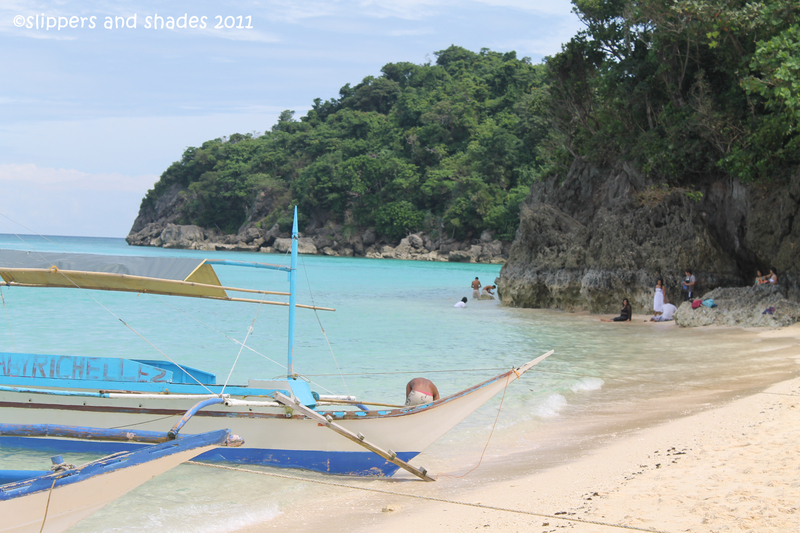 From Puka Island to White Beach, we had a revealing ride. Take a look at these pictures. And this ended our island hopping. We gave Julius P300 as tip for his good accommodation. 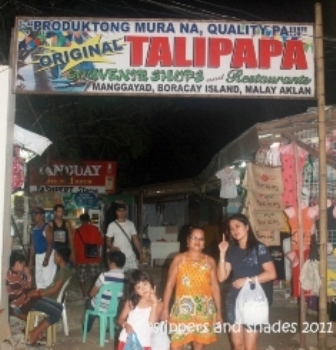 We took an hour of rest then we headed to D’Talipapa where items are sold at cheaper price. It was located at the back of Sands Hotel, in Station 2. 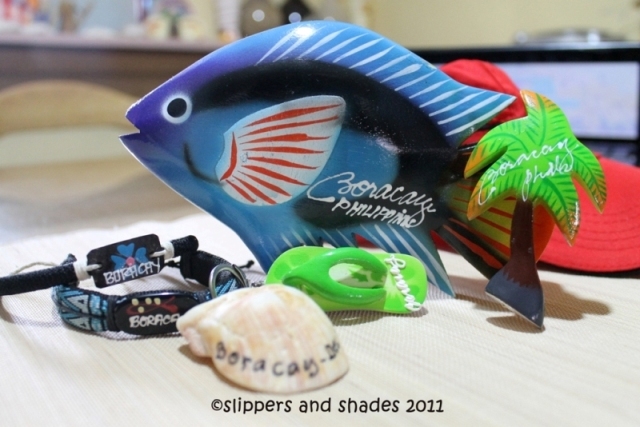 We bought these items: 8 key chains (fixed P100), bracelets with name tag Boracay (P10), canvas bag with I love Boracay (P130), 8 magnetic fish (fixed P100), big wooden table fish (P130) and nemo hanging wooden fish (P180). White t-shirts depending on sizes (P90 to P150) and good quality colored t-shirts (P300 to P400). I was expecting that these items were expensive here at Bora. 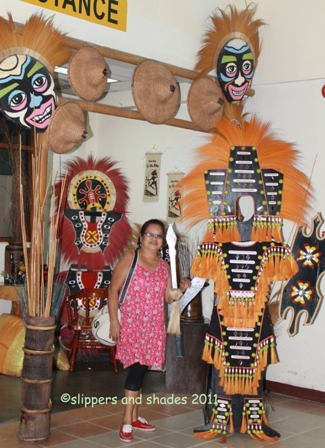 But to our surprise, it was much cheaper compared to other places that we’ve been. We waited for the sunset at the beachfront. The long stretch was more crowded by this time and just like me; most of the people were holding their cameras/slr waiting for the spectacular sunset photo. I got too excited as the sun slowly goes down. The golden hue was wonderful. The paraws were indeed a good backdrop. 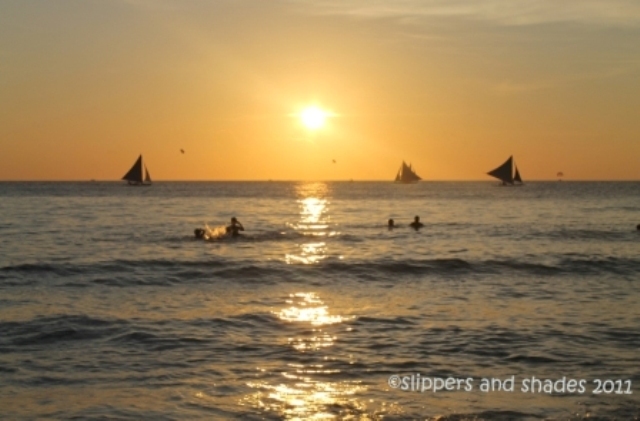 I was thankful to the good weather; I had now my very good shot of one of Boracay’s pride, the SUNSET. We ate our dinner in Andok’s restaurant which was few minutes away from our hotel. We had a long table in the beachfront. It was a fiesta crowd everywhere. After our dinner we watched again poi dancing in a nearby restaurant. A ballad singer followed next. It was Sunday and is not peak season yet so there were few activities in the beachfront. Since it was our last night in this beautiful island, we walked around and mingled with the crowd. The day was exhausting, but everyone, I say, everyone really had fun! Boracay is considered the beach capital of the Philippines and is famous because of its powdery white sand and crystal-clear blue waters. 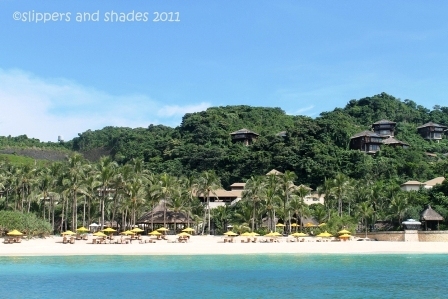 Our long time family plan to go to Boracay was finally set and we booked our flight August of this year. My brother-in-law Noel will be arriving from Israel by December and so we had a two-family getaway (mine and my sister Gi). This is once in a lifetime “get together” so we wanted to enjoy a maximum beach escapade and Boracay is definitely a place to go. Our 3:35 pm flight going to Caticlan via Cebu Pacific Air was cancelled and we were transferred to 6:10 pm Kalibo flight. I asked the cashier the reason and she answered, it’s due to sunset elevation in Caticlan. In exchange for the delay, we were given food, free van ride from Kalibo to Caticlan and one free domestic travel each. Land travel from Kalibo was one hour and twenty-five minutes to be exact. We arrived at Caticlan port by 9:30 pm. 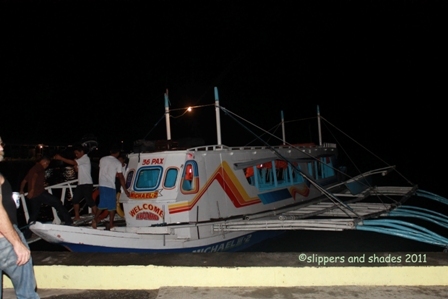 Luckily there were still passenger boats (or we will pay P1,200 for private service if we arrive there beyond 10 pm). Shen and Rion were free from charges since they were both below 12 years old. Boat ride was seven minutes only going to Station 2 port. 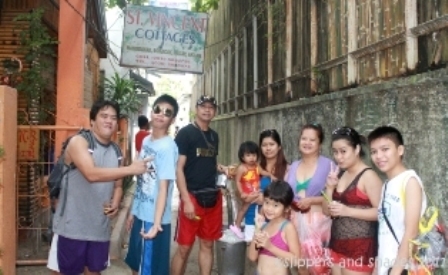 We paid P100 for the tricycle going to St. Vincent’s Cottages. Grace, our contact person, was already sleeping when we arrived. It was Lea who accommodated us to our reserved medium size rooms (P1,500/per night, discounted price courtesy of Ms. Glo, a family friend of the owner). Our chosen room had a small balcony with two double beds, tv and comfort room. There’s no kitchen inside so we headed down to the big dining area for our dinner. 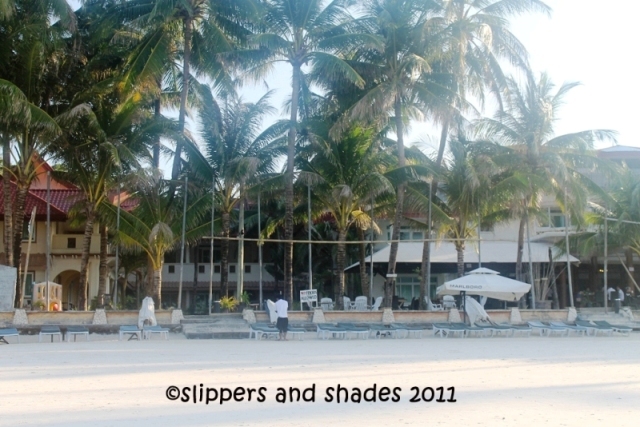 After few minutes of rest, we excitedly scampered away from our rooms to explore the beauty of Boracay. 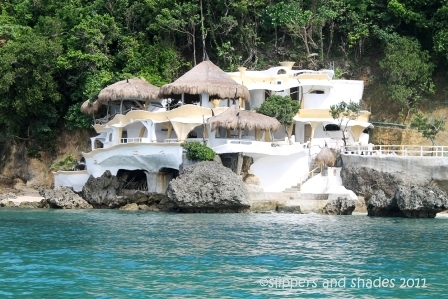 We passed by La Carmela de Boracay, Police Station, Canyon de Boracay and Alice Hotel. When we reached the shoreline, we immediately grabbed handful of sand and examined its texture. Just like a granulated sugar, it was very soft and very fine. It was not crowded yet and there were no people swimming in the vicinity. 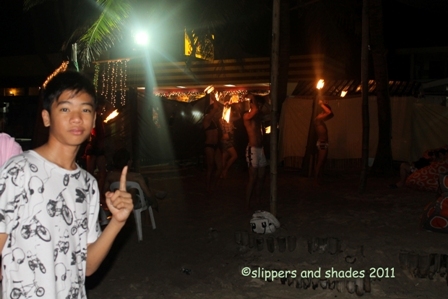 The only activity that night was poi dancing (fire dancing). After watching we proceeded to Station 1. 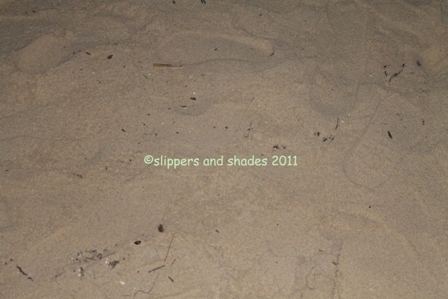 It was so wonderful walking barefooted in the sand for its fine powdery texture. We stopped in front of Regency Hotel to watch a band performing so lively. The beachfront light was so bright. Lots of kids were having a great time wading on the water. It was night-time but what was amazing, there was still greenish color in the water. Pao, Shen, Miko and Pol can’t help themselves not to swim for the water was really inviting. Rion was still widely awake watching her sister and cousins. 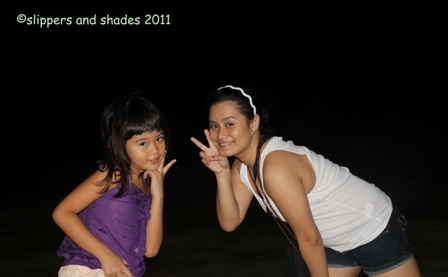 Me, my sister Gi and our Mama sat on the sand savoring the cool breeze coming from the sea. The two dads, my hubby and Noel were busy watching the live band. Everyone of us were all busy in our own universe. I can’t sustain my happiness for finally we had set foot in our country’s most beautiful beach. It was twelve midnight when fireworks blasted on the night sky. It was a child delight watching it soaring up high in the horizon. Later the sky was cleared again. It was already 1 am but everyone was still alive and full of energy. The band was still singing wonderful songs and my younger buddies were all still busy in their night swimming activity. There was no summer crowd so its amazing to watch the waves as it gently played on the shore. Well, this is the start of what is VACATION all about. We went back to our rooms by 2 am. Can’t wait for the next activity to come. Everyone of us was deadly tired when we got down in bed. Good night Bora!